When looking at compensation data, it’s important to take cost of living (COL) into account. Salaries feel different depending on where you live due to housing, groceries, utilities, transportation, healthcare, and more. For example, an impressive $133,000 software engineering salary in San Francisco only yields about $81,000 in buying power (aka the COL-adjusted salary). That’s a whopping $52,000 difference. Meanwhile, in Atlanta, a software engineer’s COL-adjusted median salary is actually higher than their median salary because of Atlanta’s lower-than-average cost of living. So while it’s certainly important to consider median salary when evaluating compensation, it doesn’t tell the whole story. Jobseekers need to know how much those salaries are worth in any given location. In response to recent discussion on this topic, we decided to look at the median salaries and COL-adjusted median salaries for some of the most popular job titles in the U.S. Then we’ll compare across 15 major markets to see which MSAs offer the most buying power for each job. Where the data comes from. If it accurately represents a salary’s true value. Data pulled from only one source (e.g. self-reported surveys) and without COL adjustments will be inherently incomplete. Context is critical, and we believe jobseekers benefit most from complete data built on diverse sources. And here are the 15 MSAs we’ll evaluate, ranked from least expensive to most expensive based on C2ER’s Cost of Living Index. For reference, a score of 100 equals the national average. Now, let’s look at the buying power for each of these 10 job titles. It’s no secret that software engineers make good money. Especially when they’re employed by some of the biggest names in the tech world, e.g. Oracle, Amazon, Apple, Lockheed Martin, and JPMorgan Chase, etc. But look at how COL affects their buying power, particularly in Southern California. Representing the healthcare industry, registered nurses are no strangers to cost of living issues. In San Francisco, we can see a $50,000 difference between median salary and COL-adjusted median salary. But in Austin, Dallas, and Atlanta, nurses have considerably more buying power (aka the COL-adjusted wages) due to the lower cost of living. Some of the top companies posting for nurses are Anthem, HCA Healthcare, U.S. Air Force, DaVita, and Fresenius Medical Care. True to their name, business analysts analyze a company’s systems and processes to see where improvements can be made. The top companies hiring business analysts are Anthem, Homeadvisor, Oracle, Unitedhealth Group, and U.S. Bancorp. Top skills include the SQL programming language, business process, business analysis, management, and communications. Executive assistants play a critical role in helping a company thrive, supporting executive teams and performing administrative and clerical duties. The top companies hiring executive assistants are Anthem, Oracle, Marriott, University of California, and JPMorgan Chase. Top skills include Microsoft Access, office management, management, communications, and Microsoft Office products. In general, account managers are responsible for managing sales and customer relationships for a particular group of accounts. The top companies hiring account managers are Oracle, IBM, General Electric, Stryker, and IQVIA. Top skills include selling techniques, account management, customer service, communications, and leadership. Customer service representatives interact with customers, answering questions, providing solutions, and responding to complaints. Top companies posting for customer service reps include Walgreens Boots Alliance, Family Dollar Stores, Lowe’s, Domino’s Pizza, and Home Depot. Top skills include merchandising, call centers, selling techniques, and some “human” skills that are in demand across the labor market right now, including communications and management. Generally, marketing managers plan and direct marketing efforts, determine demand for products and services, and identify potential customers. The top companies hiring marketing managers right now are Oracle, Anthem, Amazon, General Electric, and IBM. Top skills include product management, business development, new product development, management, and sales. Recruiters find and hire top performing talent for companies—often using compensation or demographics data to be more strategic. The top companies hiring recruiters are Amazon, IBM, Oracle, Salesforce, and Deloitte. Top skills include applicant tracking systems, purchasing, sourcing (recruitment), management, and communications. Data scientists have the valuable ability to collect, clean, analyze, and interpret data, along with communicating their findings. Unsurprisingly, several tech giants are among the top five companies looking for data scientists: Amazon, Booz Allen Hamilton, IBM, Microsoft, and Anthem. Top skills include Python, machine learning, R, data analysis, and mathematics. Combining design and technical skills, product designers create the look, feel, and user experience of products. The top companies looking for product designers are Oracle, Anthem, Amazon, IBM, and General Electric. Top skills include graphic design, prototyping, user experience, user interface, management, and communication. It’s easy to look at the $133,000 median salary for a software engineer in San Francisco and think, “Wow, that’s a lot of money!” But that number doesn’t take into account how much those software engineers actually have left to spend after basic cost of living expenses in the notoriously expensive metro. 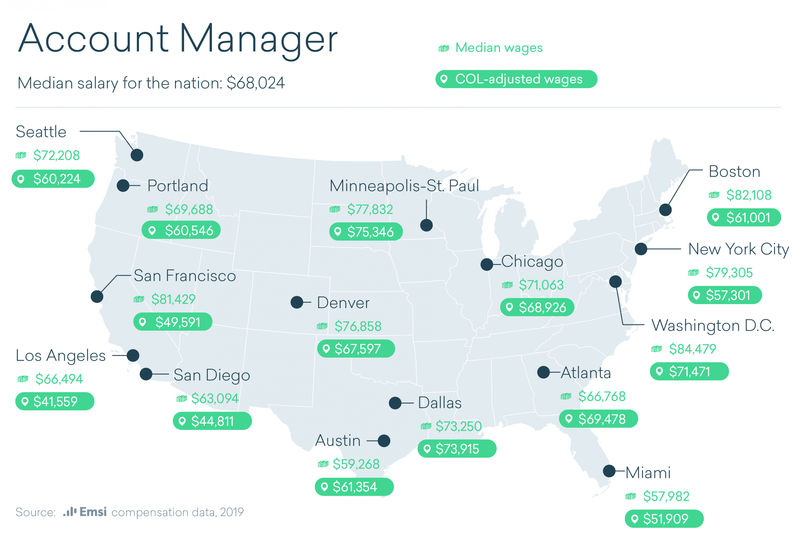 For example, that San Francisco software engineer might be better off taking their talents to Seattle, Austin, Dallas, Atlanta, or D.C. where the COL-adjusted median salary is still in the six figures. Jobseekers care about what a job pays, no doubt. But they also want to know how far those dollars will go. They care about the cost of living, which plays a huge role in helping them decide where to locate themselves and their families. As always, context is key. For more information about Emsi or our data solutions for businesses, please contact Jon Dion at jon.dion@economicmodeling.com or fill out the form below.